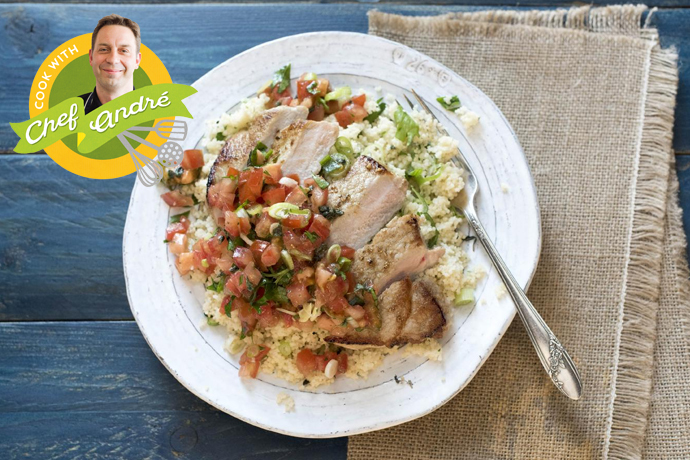 Last night our wonderful chef Andre cooked our Coriander Spiced Porkwith Couscous, and Herby Salsa live on Facebook. If you missed it, you can watch it down below to get all his incredible insights on cooking pork! His kids even joined! We also had our lovely buyer Louise explain our meat sourcing process, for anyone who has questions about our meat! When cooking meat at high temperatures, use sunflower oil not olive oil. Olive oil isn’t designed to withstand high heats! Season your couscous and use stock not just water. The key when you’re making a stock or soup quickly is to sweat the veggies. Chop them up, put them in a big pan with a splash of oil and put the lid on – use a low heat. Let them sweat and THEN add the water. Massage your couscous with your hands before you add the stock – this stops it from clumping. Other good grains for this dish – freekeh and quinoa. Great if you’re gluten free. Herbs that work well with pork are sage, tarragon and rosemary. If you cook stock and you want to store it – freeze it! You can use ice cube trays for this! You can freeze fresh herbs in butter – also in ice cube trays. Then add it when you’re cooking meats. Delicious! To keep your pork moist – don’t cook it for too long!